We drove south out of Munich towards the Alps. The area is a gently rolling farming country with a wall of mountains on the south. It reminds me of the way that the Rocky Mountains rise out of the Great Plains near Denver. Straight up! We run up a valley and over the pass into a valley in Austria, we bypass Innsbruck and turn toward Brenner Pass. 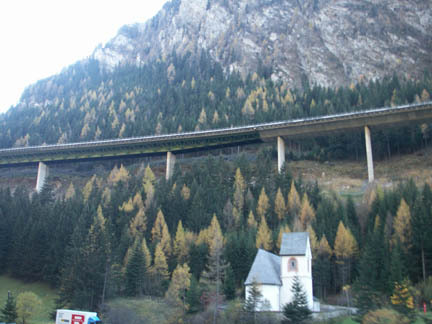 There is a 4 lane divided highway going over Brenner Pass, (above us, in the picture to the right) but a vignette (windshield sticker) is required to travel on it. The vignette is an annual pass for 40 Euros, but we're only planning on traveling on 35 kilometers of it this year, so we take the old highway. It takes three times as long but is much more interesting. The Larch trees were turning a yellow color that glowed brightly in the cold sunshine. We ate lunch in Brenner Pass and then, because we are in Italy, got on the 4 lane highway and followed it down through a valley in the Dolomites, marble mountains to the south of the Alps. This was like a trip through Yosemite Valley, but it had bigger bare rock mountains and went on many kilometers more. 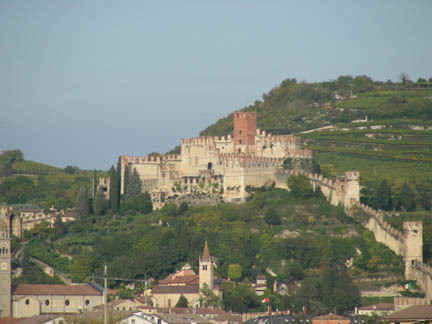 The hillsides were decorated with castles, vineyards and small villages that went by so fast. We will have to return and tour the Dolomites later. 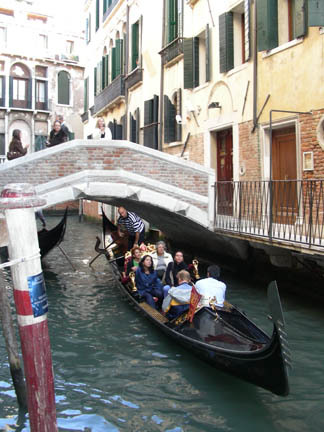 What can more one say about Venice, it is all it is hyped up to be and it is as bad as claimed. 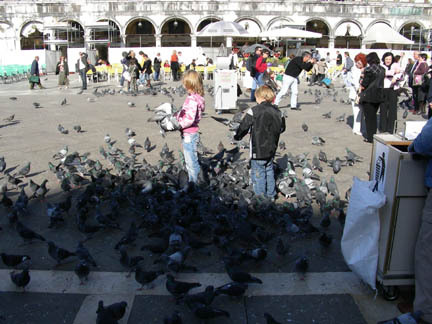 We arrived after a one day trip from Munich at a campground near Venice called Camping Venezia. It is the nearest one to Venice itself and knows it. It is expensive, twice the cost other campgrounds we have been in, and only so-so maintained. But it is only one bus stop from Venice itself. The next morning we took the bus into Venice. 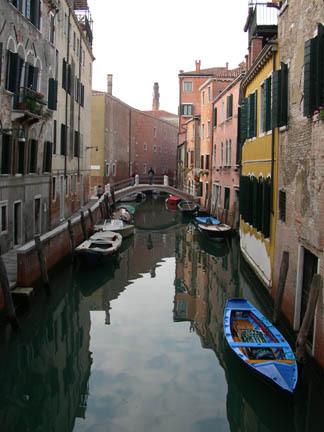 Venice is a group of islands, totally covered by buildings, about 5 kilometers from the mainland. There is a causeway connecting Venice to the mainland that is wide enough for 4 railroad tracks and a 4 lane divided highway. All of this ends in a huge train station, huge bus turn around and huge 6 story parking garages, from here you walk or take a boat. The amount of traffic into and out of Venice each year has to be enormous to justify building this big dead end causeway. The first day we walked and did the tourist stuff at Saint Marcos Square and walked and walked. We walked narrow lanes crossed humpback bridges all over town. It is as beautiful, romantic, old and quaint as the lovers say. It is also dirty, smelly, graffiti'ed and crowded at the critics say. I would hate to be here in the tourist season. It is October 31, the weather is sunny but cool, getting up to the mid 50's F. during the day and dropping to freezing at night. On our last day (we spent 4 days there) we bought a couple of day passes good on all the land based buses and the water based buses. We used them to go to Murano, the island nearby where the furnaces are for glass blowing. 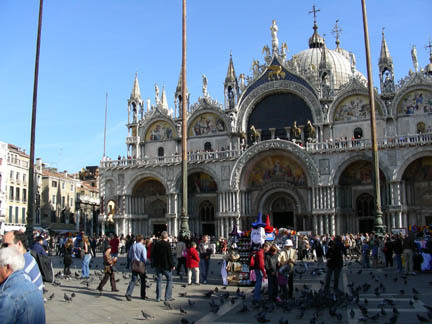 This is where all the "Venetian glass" is really made. We watched some being made and toured the glass museum, bought some souvenirs and went back to Venice. Below are some random pictures. 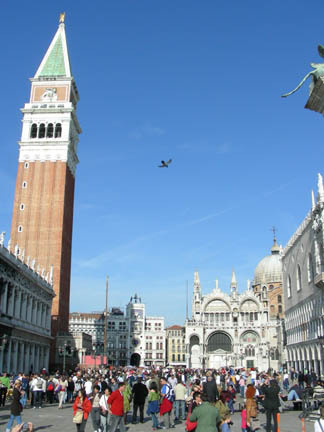 Two views of St. Mark's Square. 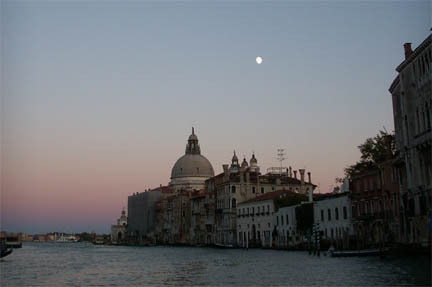 Full moon over the Grand Canal. 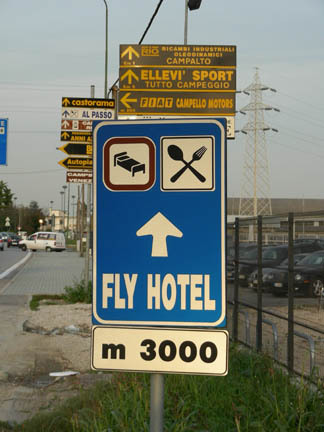 We did not stay here, but it is near the airport. I hope that is the reason for the name.